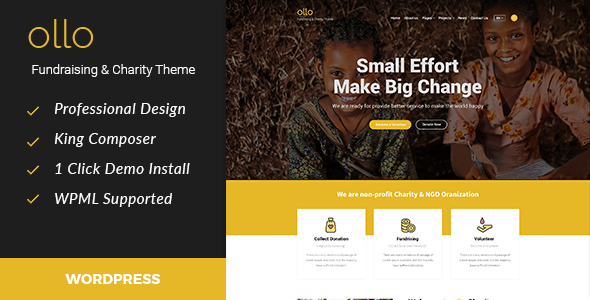 Ollo is a WP Theme specially designed for Charity, Fundraising, Donation, Volunteer website. You can use this beautiful Theme for your every need. The Theme is100% Fluid responsive on any device. We have tested this in iMac, Macbook Pro, iPhone 7 Plus, iPad mini 2 and Samsung S8. In addition, you are getting 18+Unique WP files. Everything is in Documentation file so that you can change anything easily. For the firs time, We have used REAL Content so that you can change the wording easily.